Of Cape Croker, peacefully at Grey Bruce Health Services Owen Sound on Friday, February 14, 2014. 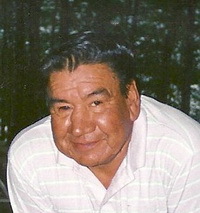 Franklin Lionel Valentine Lavalley at the age of 79 years. Loving husband of Alice (nee Petonoquot). Proud father of Rick (Virginia) Lavalley, Fran Petonoquot-Ritchie (Paul Ritchie), Steven Lavalley (Tami Martin), Wanita Lavalley, Stephanie Lavalley (partner Eugene Thomson), and Fred Lavalley (partner Sarah Jones); grandfather of 15; and great-grandfather of 19. Devoted brother of Isabel (Frank Millette), Byron Lavalley, Evelyn Brennan, and Peter Akiwenzie (partner Jackie); and brother-in-law of Kathleen Lavalley. Sadly missed by his many nieces, nephews, and his special friend David Keeshig. Predeceased by his parents Fredrick and Gertrude; siblings, baby Isabel and baby Francis, Tilley Powell, Larry Lavallee, Hector Lavalley, Victor Lavalley, and Earl Akiwenzie. Visiting at the Cape Croker Community Centre Tuesday, February 18, 2014 from 2-4 and 7-9 PM, where a service to celebrate Frank's life will be conducted Wednesday at 2 o'clock. Cremation to follow. Arrangements entrusted to the Thomas C. Whitcroft Funeral Home & Chapel, Sauble Beach (519) 422-0041. Donations to the Heart and Stroke Foundation, or Canadian Diabetes Association.